The Coma acts as a cautionary tale, albeit that of a farfetched one. Overworking school students will lead to a nightmarish hellscape where teachers attack students who fall behind. Yes, it’s a bit of a stretch, but underneath it all it speaks to the harsh conditions and pressures that Korean students experience through their education system. Related reading: Another game with a very similar sense of horror is Corpse Party. Matt's review of the Vita release here. The Coma places you in the shoes of Youngho, a student at Sehwa High. In the midst of exam period, Youngho is stressed, tired and fearful at the prospect of failing school. In his final exam, Youngho falls asleep, only to wake up in a nightmare, hiding from his teacher who has turned into a bloodthirsty demon. There’s a general sense of despair in the air. When you arrive to school for the first time, you learn that a fellow classmate has attempted to take his own life, presumably as a result of the same kind of stresses that Youngho is facing. It provides an intriguing setting, and acts as a means of establishing that the high school is not a pleasant place by any means. Your flashlight acts as the only means of light, and even then, the corridors still pose a threat. A stark juxtaposition from the peaceful halls of the school that you'll see during the day, the nightmare’s school has shattered glass windows, blood stains, and demonic beings stalking the halls. 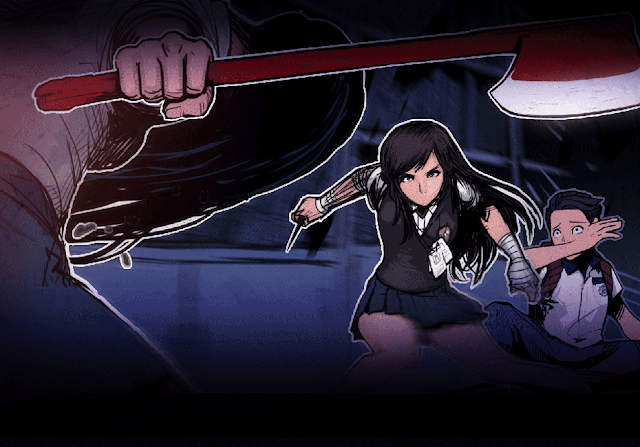 As the game is played on a 2D plane, often you won’t see your attacker until it’s too late, however there is a very good implementation of sound effects. As you walk through the deserted halls, you can hear footsteps, they sound like your own... that is until you stop walking and there are still footsteps echoing in your ears. The game constantly found ways to bring me back to one of my childhood fears, one that I presume I share with many; the fear of the dark, the fear of the unknown. That is a fairly common motif for horror, of course, but it's common because it is so effective; not being able to see what’s in front of you creates a real sense of tension, which leads to outright fear when you know there's something hostile in the unknown dark out there. 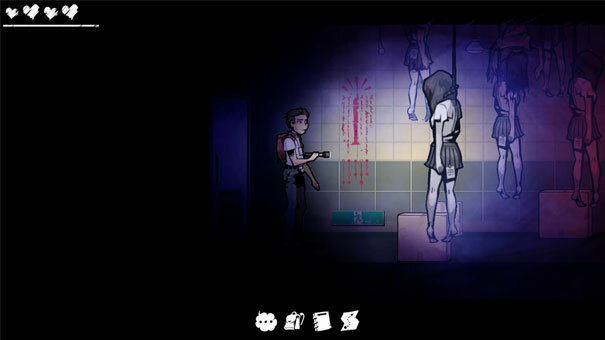 The Coma takes inspiration from many of the recent horror games that feature repetitive “locker sequences”. I use that term to describe the endless hours (or so it feels like) spent waiting in small cupboards or cubicles hiding from those who are stalking you. It's a sub-genre of horror that has always been bubbling underneath the surface; pioneered by the Clock Tower series, and nearly perfected by the PlayStation 2 classic, Haunting Ground, it has never been a favourite approach to horror for developers, but the way it disempowers players makes it one of the more authentic ways to build a genuine sense of dread and fear in the player. You have little means of defending yourself so naturally, the best way to stay alive is to run and hide. I wouldn’t mind this so much if it wasn’t for the unnecessary backtracking the game forces on you. The Coma plays out like one giant fetch-quest, with other students who have fallen into the same nightmare as you directing you to go to rooms all over the school to retrieve items that will benefit them, whilst allowing Youngho to solve the mystery that he finds himself trapped in. These moments will constantly result in a being emerging from the dark that Youngho then has to run and hide from. It gets old fast, and makes the horrible mistake for a horror game; because it is so repetitive in execution players become desensitised to what's going on, so the atmosphere dissipates substantially. The hand-drawn aesthetic reflects the panic frame of mind of the protagonist. Characters and objects have quickly been sketched, with a thick outline for important objects. It presents a feeling of rushing and panic, no doubt a thematic reference to the students who are struggling under pressure to perform, and are rushed as a consequence. The halls at night are shrouded in a dark, blue hue that make it impossible to identify anything clearly, and the flashlight, a tool used to show the halls as they truly are, reflect the view of the students at the school. They’re only able to look at what’s right in front of them, the pressured environment that surrounds them clouds their vision, only making everything seem more horrific. Rarely has the visuals of a horror game been designed so perfectly to match with the narrative theme, and the result is something distinctive, creative, and terrifying. Related reading: And for a big budget take on the stalker horror genre, check out Until Dawn on the PlayStation 4. Everything else is quite simple when it comes to the actual gameplay. Aside from moving, interacting with objects and turning the flashlight on and off, there is no other complex game mechanics. 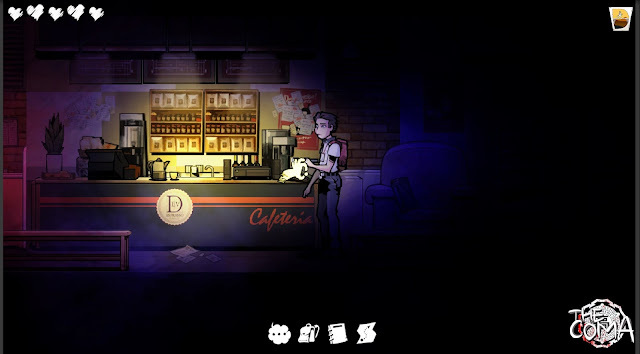 The Coma is essentially a horror adventure game. It would have been nice if there could have been efforts made to make the game more survival horror. Youngho has health and stamina levels to maintain, he can either pick up food throughout the school or use a vending machine with money found in backpacks or desks, but otherwise resources are limited. Copious save points help when death becomes a problem, but that actually hurts the game on one level, as it brings the repetition core to the gameplay into even sharper focus.